Photo Cutty Ranks black and white photo shot by Floyd Celluloyd for Innermann a decade of reggae photography. Please respect the copyright. Do not use the photos without written permission. Philip Thomas, better known as Cutty Ranks was born in Kingston, Jamaica in 1965. He began his career as a reggae artist at the age of 14 with the Gemini sound system, before moving on to work with Tony Rebel's Rebel Tone and Papa Roots, and later working with Stereo Mars, Arrows and Metro Media. 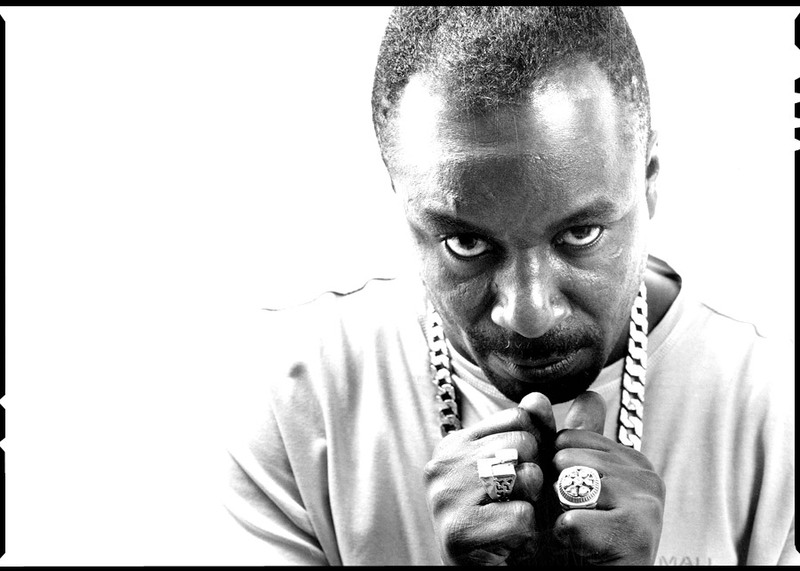 He joined Killamanjaro where he worked alongside Early B, Super Cat, Puddy Roots, and Little Twitch, and then Sturmars where he worked with Josey Wales, Nicodemus, Super Cat, U Brown, and Yami Bolo. His first job on leaving school was as a butcher. During the 80s, Ranks moved on to the Arrows sound system and his debut single "Gunman Lyrics" was recorded for Winston Riley's Techniques label. He also recorded such tracks as "Out Of Hand" and "Fishman Lyrics" with Riley and after spending some time in Miami working with Super Cat and Nicodemus, he worked with Patrick Roberts' Shocking Vibes label, releasing the single "The Bomber". In 1990 he joined Donovan Germain's Penthouse label, enjoying a hit with "Pon Mi Nozzle". Ranks came to the attention of London-based Fashion Records and in 1991, he released "The Stopper" and a debut album of the same name for Fashion, following this up with the album Lethal Weapon in the same year for Penthouse, featuring singers such as Marcia Griffiths, Dennis Brown, Wayne Wonder, and Beres Hammond. His follow up albums From Mi Heart and Six Million Ways to Die were released on Priority Records in 1996. Six Million Ways to Die included a hip hop remix of Ranks' song "A Who Seh Me Dun" which was voiced earlier over the Bam Bam riddim in 1992. In 2000, he released the album Back With A Vengeance produced by King Jammy. This album saw Ranks venture into other musical styles, including hip hop and dancehall. His song "Bomber" is considered a classic in Jamaica. Cutty Ranks has been influential outside the world of dancehall, particularly in the field of drum 'n' bass and jungle. His vocals have been frequently sampled and his songs remixed by artists such as Goldie.